Millions of men are completely clueless when it comes to choosing a Christmas gift for their significant other a new survey has found. 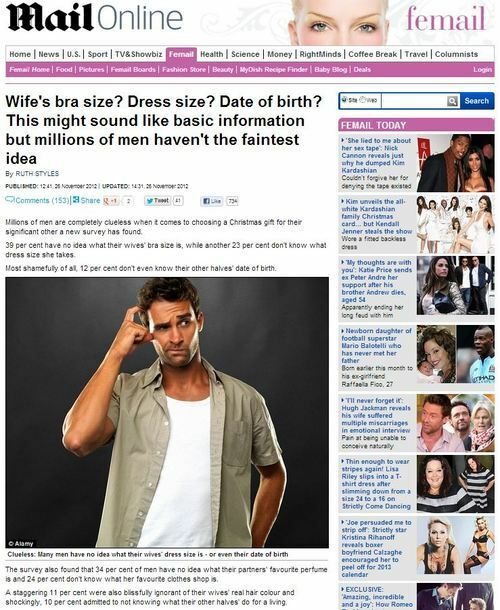 39 per cent have no idea what their wives’ bra size is, while another 23 per cent don’t know what dress size she takes. Most shamefully of all, 12 per cent don’t even know their other halves’ date of birth. …Not surprisingly, the research, conducted by high street beauty retailer, Superdrug, also found that 40 per cent of couples have fallen out because the man has forgotten – or not bothered to ask – about things he ought to know. Facing each other over the breakfast table each morning, a husband and wife might think they know everything there is to know about each other. In his case, he would probably be wrong. 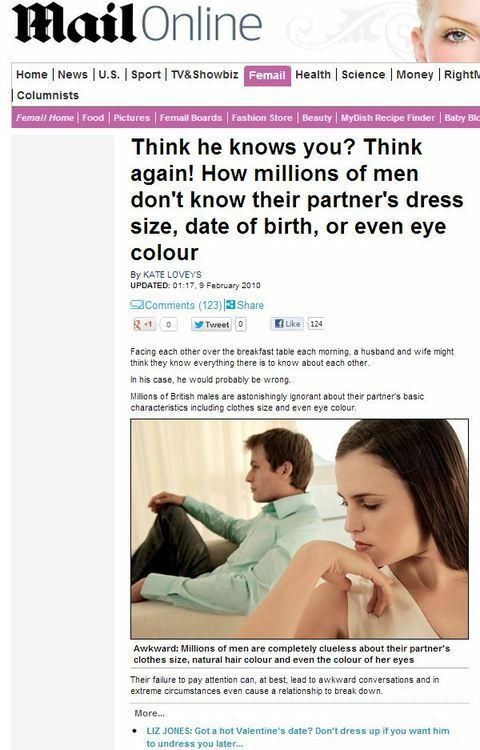 Millions of British males are astonishingly ignorant about their partner’s basic characteristics including clothes size and even eye colour. According to a survey of 2,000 men buying scent for their female partner at the Perfume Shop, six out of ten believed they knew her inside out. So, if this data was from men caught walking out of the Perfume Shop, what gives? 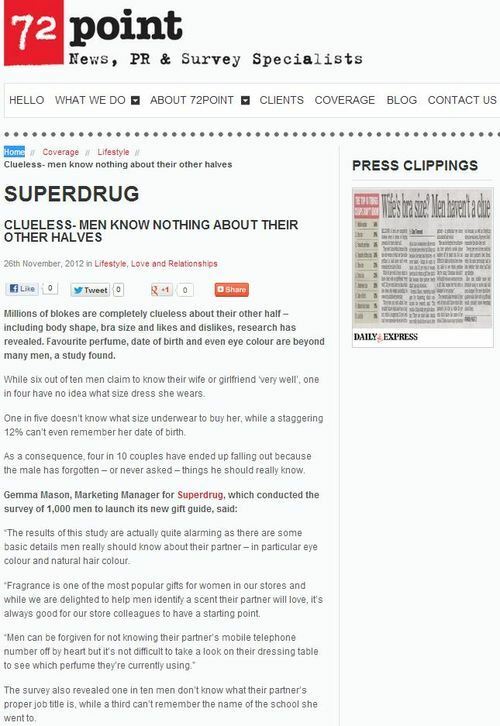 Has Superdrug hijacked the research to run an almost-identical story over two years later? This leads to some rather intriguing questions, it’s fair to say. For instance, was the data gathered by the Perfume Society back in 2010 so stunningly accurate that almost three years later it correlates so closely with the figures gathered in a follow up study? Or, conversely, was the data gathered in the survey commissioned by the Perfume Shop repackaged, slightly updated and then re-sold as being for Superdrug much later? We know for certain Superdrug were behind the latest story, as their press release is still featured on the 72 Point site, so this certainly isn’t a case of Superdrug rechurning the work done for the Perfume Shop brand. This entry was posted in Christmas, Superdrug and tagged 72 point, christmas, daily express, daily mail, Dan Townend, Gemma Mason, Kate Loveys, onepoll, ruth styles, superdrug on December 19, 2012 by Michael Marshall.